So… did you watch the Oscars? I can't help but watch every year. It's sort of like the Super Bowl for all of us who didn't get into sports in high school – and you know who you are. The drama club members… the honors English crowd… the A/V boys. The big news, of course, was the success of the Coen brothers and their really dark, really violent film No Country for Old Men. I haven't seen this film yet, mostly because it isn't the kind of film my wife will see with me, so I'll have to rent it sometime and watch it alone. Frankly, it isn't the kind of film I will usually watch, but I'm a big Coen brothers fan, so I'm going to have to check it out. 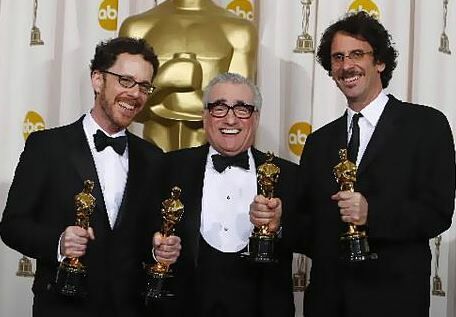 The Coens' films have been some of my favorites – especially their lighter films like The Hudsucker Proxy and O Brother, Where Art Thou? – which is one of my favorite films of all time. This new one isn't one of their "lighter" films, but, given the Oscar and all, I think I'll have to check it out anyway. I owe it to them. Is it just me, or is Martin Scorsese turning into a cartoon character? Which one is it… Mr. Magoo? Help me out. Post a comment and tell me which cartoon character Martin Scorsese is 'morphing' into. By the way, if you liked the song from the Irish guy that won best song, check out their film, Once. It's a very interesting example of what a clever filmmaker can do with very little money (supposedly about $100K). If you're a filmmaker lamenting that you can't raise the $10mm you need to make your 'epic', go watch Once and the Christian micro-budget film Facing the Giants. Much can be done with little, my friends! That's all for now. Next week I'm going to start telling you about our new project here at Jellyfish. I figure it's about time to start letting the cat out of the bag. That'll be fun, eh? Yes yes! Then dunk the cat in water too. That’ll make things really interesting. Is is whatever you’re going to tell us about have anything to do with all those layouts you showed me last year? Cause I reeeeeally wanna know what those were for. joshmshep.comI’d say Scorsese is looking more like the creepy dancing old guy from the Six Flags commericals. Actually, I think it’s Mr. Potato Head, but there’s someone else mixed in there I can’t quite put my finger on. Ooh yes I’ve been waiting to hear about new Jelly stuff! did you know that in some of the newer shows like Gideon, Lord of the beans in VT. In the backgrounds for crowds, some of the veggies look like cardboard? Plus if you you look closer, the cardboard characters look like the characters from Jonah a VT movie. I love Jon Stewart…and Stephen Colbert. he looks like a plump version of the creepy six flags guy! and mr magoo i guess…interesting! No, no, no… not Mr Magoo. He’s becoming an amalgam of every character Ed Wynn ever voiced. Just look at the picture and imagine Ed’s laughter from Mary Poppins. Captain Jason T Conrad in “321 Penguins The Next Generation “?? To be honest, I think Scorsese looks like the wizard (Archie in the costume) from the Wonderful Wizard of Ha’s. Don’t you? On best song, I wish one of the Enchanted ones had one. But that’s just me. And on the telecast, wasn’t it interesting how one of the Irish two who won for best original song didn’t get to speak, so they brought her back after the commercial break? That was a bad mistake..
Ha! Yeah, I think he’s looking like a combination of characters and the 6 Flags guy. I agree that Once is worth checking out. It is one of my favorite movies of 2007. I really wanted them to win for the song and was glad Jon Stewart brought Marketa back out to speak. Check out the movie and the soundtrack. Better call Ken Ham. This will be a serious problem for Answers in Genesis. Anyway, I can’t wait to hear about the Jellyfish project! If you squint a little, he looks a little like the KFC guy, without the beard. Yeah, add a beard and a bucket of chicken, and you’re set! Oh, and Facing the Giants is awesome! Have you guys seen FlyWheel? It’s by the same people. Ah! That is so like my own husband! Sometimes he likes to see an “intense” movie. I won’t watch those because they put me in a funk afterwards. But then, I don’t want David to feel so whipped that he can’t see a guy flick when he wants to. So, sometimes he gets those lone-wolf rental nights! I totally agree that Surf’s Up is worth your time! My husband took a couple of our little people to see it in the theater and said, “Hey, that’s the first surfing movie my kids could enjoy with me!” No ridiculous skimpy bikinis, etc. And still, the awesome thrill of a killer wave! In general, I search the “message” of a movie carefully to detect agendas that I wouldn’t want my kids exposed to- this one checked clear of that in moy opinion. It’s not McGoo or Pa Grape. It’s Bert of Bert and Ernie! The eyebrows do it. Giants was a great film! I haven’t seen any of the nominees from this year either, and I usually try to see them all before Oscar Night. The only movie I saw last year was The Chipmonks. It was funny and fun. I liked the original 3:10 to Yuma, but haven’t seen the new one yet. I’m totally with you on the Surf’s Up review, Mr. Vischer. I think it has such a great message to kids about not giving up and remembering the important things in life. No mention of God that I remember and there are a few words I’d rather my kids not hear, but it does speak to all of us remembering our priorities and putting others first. My kids and I had a very “Mr. Brady” discussion about it after we bought it. I love it and it always makes me feel good after watching it.